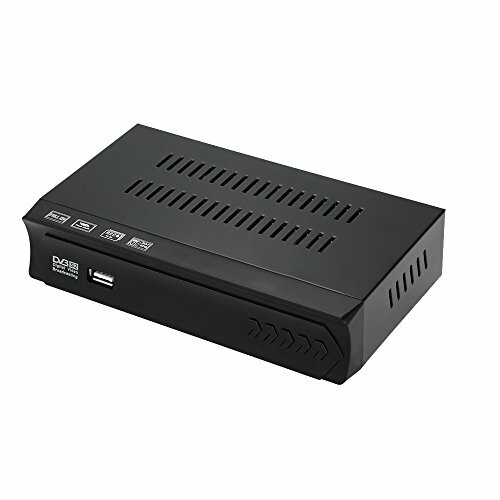 This item cannot be used in FranceFeatures: Hard Specification:CPU: Novatek 78304 Embedded Demodulator.Memory: 32 * 16Mbit DDR2 Frequency:1066.Flash: 32M bytes.TUNER: AV2018.USB 2.0: Embedded One Host.Software Features:Fully comply with DVB-S/S2, MPEG-2/4 H.264 Standard.Supports single / multiple or blind search satellite search.Automatic PAL / NTSC conversion.Support DiSEqC 1.0 / 1.1 / 1.2/1.3 (USALS) protocol. Various channel editing function (favorite, move, lock, skip, delete, rename, find, sort).Support BISS KEY.Support teletext/subtitle/multi-language.Powerful and highly effective 7-day EPG function.AUTO, 16:9 Pillar Box, 16:9 Pan G Scan, 4:3 Letter Box, 4:3 Pan G Scan, 4:3 Full, 16:9 Wide Screen.USB 2.0 for PVR, TimeShift, software upgrade and media files playback, multimedia playback. Video output resolution: 480i/576i/480p/576p/720p/1080i/1080P.Demodulation: Frequency Range: 950MHz-2150MHz.Sensitivity Level: - 10~ - 81dBm.Mode IFFT: 2k, 8k.FEC Mode: 1/4, 1/3, 2/5, 1/2, 3/5, 2/3, 3/4, 4/5, 5/6, 8/9, 9/10.Guard intervals: 1/4,1/8,1/16,1/32.Constellation: QPSK, 8PSK, 16APSK.Decoder: Video Decoder:Compliant with: MPEG-4 part10/MPEG-2 ISO/IEC 13818.MPEG-4 Simple/Main/Advanced Profile@LEVEL3(10Mbps).MPEG-2 Main Profile# Main Level(15Mbps).H.264 MP#L3(10Mbps).H.264 HP L4.1(25Mbps).Audio Decoder: MPEG-1, MPEG-2 (Layer I/II), MP3, AAC-LC, WMA,HE-AAC 5.1 multi-channel decoding.Powerful Multimedia Features:MediaCodec: avi. mpg, .dat, .vob, .div, .mov, .mkv, .jpeg, .ts etc.Audio Codec: WMA,MP3,AAC (wma,.mp3,m4a).Photo Codec: JPEG, BMP, PNG.Supports WiFi Network Connection. In order to use WiFi connection, you need to buy a USB 2.0 WiFi Dongle (with Ralink7601/5370 main chip).